Do we ever reach an age where our personality remains set in stone, regardless of outside influences? A new study from the University of Gothenburg says no. In fact, hearing loss—a common condition that plagues nearly half of elderly Americans—can actually have a big impact on an aging adult’s personality. “To our knowledge, this is the first time a link between hearing and personality changes has been established,” says psychologist Anne Ingeborg Berg, PhD, a researcher at the University of Gothenburg, Department of Psychology. For six years, researchers tracked the physical and mental health of 400 seniors in their 80s and 90s. They also documented changes in key personality characteristics, including extroversion. According to Ingeborg Berg, the team was surprised to find that, out of the broad range of possible influencing factors (e.g. cognitive impairment, how many chronic diseases an aging adult was dealing with, vision and hearing loss, ability to perform activities of daily living, self-rated health measures), only hearing loss appeared to have a significant impact on how outgoing an elderly individual was. A host of factors undoubtedly come into play when determining a person’s demeanor, but the aches and pains of aging don’t appear to affect a senior’s demeanor as much as their ability to hear. When a person can’t communicate effectively, they tend to lose self-esteem and avoid social interactions. Even the previously extroverted may eventually withdraw into themselves, increasing their isolation and the potential for loneliness. 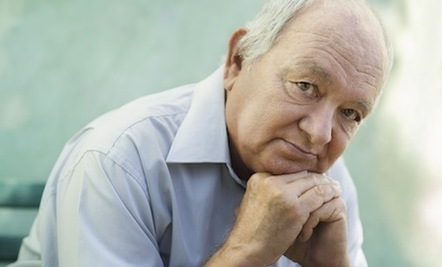 Isolation is an endemic issue in the elderly population—43 percent of seniors feel lonely on a regular basis, according to a recent survey by the University of California, San Francisco (UCSF). Much like a physical disease, loneliness can be both contagious and deadly. Older adults who feel lonely are more prone to behave in ways that may cause other people to not want to be around them. Psychologists from the University of Chicago who analyzed data from the Farmingham Heart Study, a long-term, ongoing cardiovascular study, found that solitary seniors have a tendency to further isolate themselves by pushing people away and not making efforts to engage with others. Lonely seniors are also more likely to decline and die faster. The aforementioned UCSF study found that people 60-years-old and older who reported feeling lonely saw a 45 percent increase in their risk for death. Isolated elders had a 59 percent greater risk of mental and physical decline than their more social counterparts. Some people are too proud or stubborn to alert their social circle to their hearing loss- if their friends knew, they could try to speak more clearly, avoid noisy restaurants, etc. My eustation tube closed due to allergies. My grandmother lost her hearing by contracting measles at a tender young age. I watched my poor grandmother who lost her hearing and what it did to her. Now as hearing impaired too. I wonder why people don't know this automatically. I watched my father's hearing loss lead to isolation. As some mentioned above, people have zero patience with the hearing impaired. It broke my heart to watch my dad struggle to understand conversations going on around him, or struggle to hear someone speaking with him if they spoke too quickly or kept moving their heads away, as he needed to hear the little bit he could hear, as well as try to read lips, so it was really helpful to look at him directly when speaking. Also, people including some family members can be so rude, and would laugh at him as he tried to reply or take part in conversations, and misunderstand and say the wrong thing, and I would watch him withdraw, and eventually just not want to have family gatherings or go out anywhere anymore. All it takes is patience and be thoughtful towards the person you are speaking with, it isn't that tough. His hearing aid was awful and did not help at all, despite being adjusted several times. Now, my mother got a hearing aid and had the same problems with it, until she gave up and turned to a cheaper alternative, tv ears and Sonic Super Ear. They work better for her than the expensive hearing aid did. My father had passed away before we found these things, so I don't know how they would have worked for him. Would have been worth a try, though. I'm under 40 and was diagnosed with Menieres this year after being missed diagnosed for over 9 years!!! I wear a hearing aid in my left ear...my hearing in that ear is of a 110 yr old woman. .my right is absolutely normal. I ironically landed a job working for an audiologist recently and find it "amusing" that people will buy glasses if they have optical issues yet have issues buying h.aids, as the stereotype of h/aids as the whistling bulky ugly devices of the 80's still exists. Technology has come in leaps n bounds with invisible h.aids now on the market...I upgraded mine this year n love how much technology has increased in 6 yrs since I purchased my 1st aid. It makes a huge difference. Clients think I'm lying when I say I have one till I show them. Quality of Life n hearing my loved ones was more important to me than worrying over cosmetic concerns as many people are hung up on that issue. Funny I can see they wear glasses and think nothing of it yet they are concerned I may notice if they wear a h.aid. I've also noted many cultures have huge issues wearing h.aids as well. Their client's children ( my age and over ) plead with them to continue wearing them yet notably particular cultures and of a certain age brackett have very real psychological issues dealing with them. Hearing loss is isolating. You tend to stay in the backgound whereas in your younger days you were an extrovert. Hearing aids help but do not restore the hearing you had. As a teacher of the deaf once told me, blindness cuts you off from things, deafness cuts you off from people.